As noted in my post last week, I found a cute maxi dress that came with a little bit of an issue. Unfortunately the dress didn’t come in tall. So the issue I ran in to was, a maxi dress that was about 3 inches too short. Because of the modest price point, I purchased two of them. Why would I do something so odd? So that I could take 4 inches off the second dress and attach it to the bottom of the first one. The end result, it turned out perfectly. 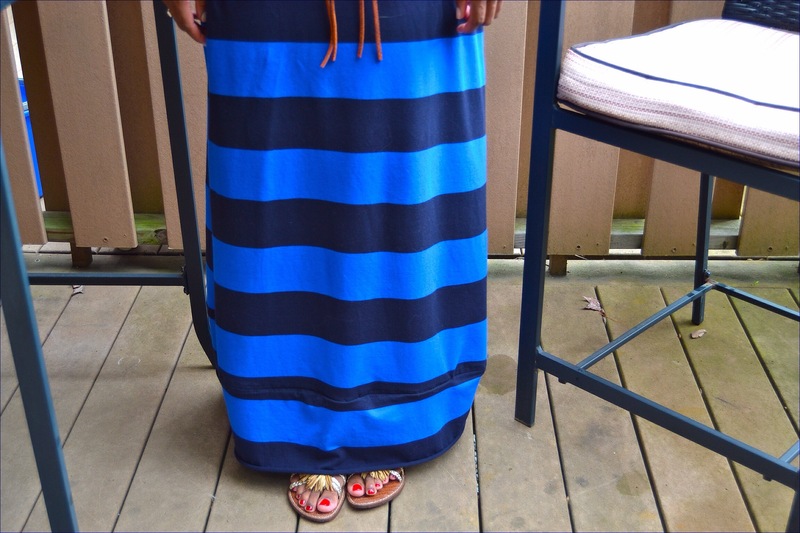 A maxi dress on a 5 foot, 10 inch girl that just barely sweeps the floor…as a maxi should. Naturally I wore it while away over this 4th of July weekend. 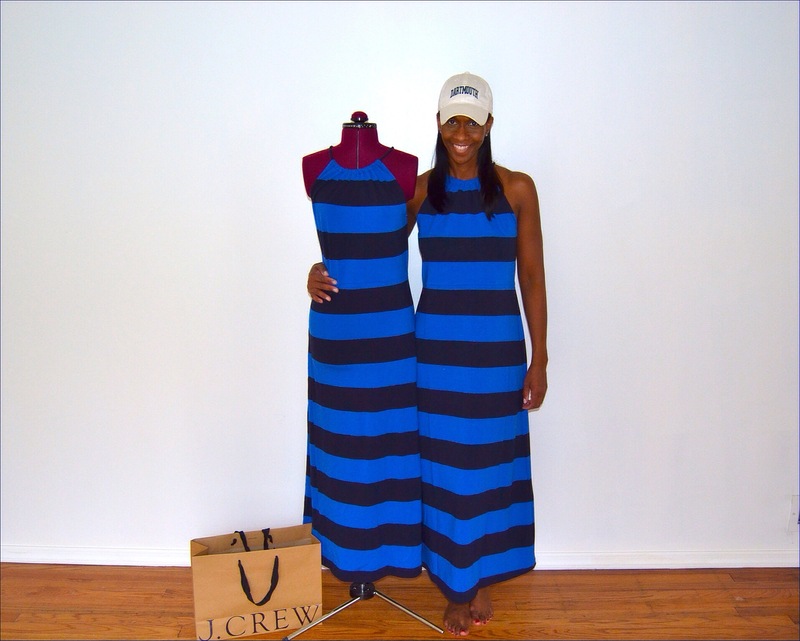 I love rugby stripes, so this is my dream casual maxi dress. 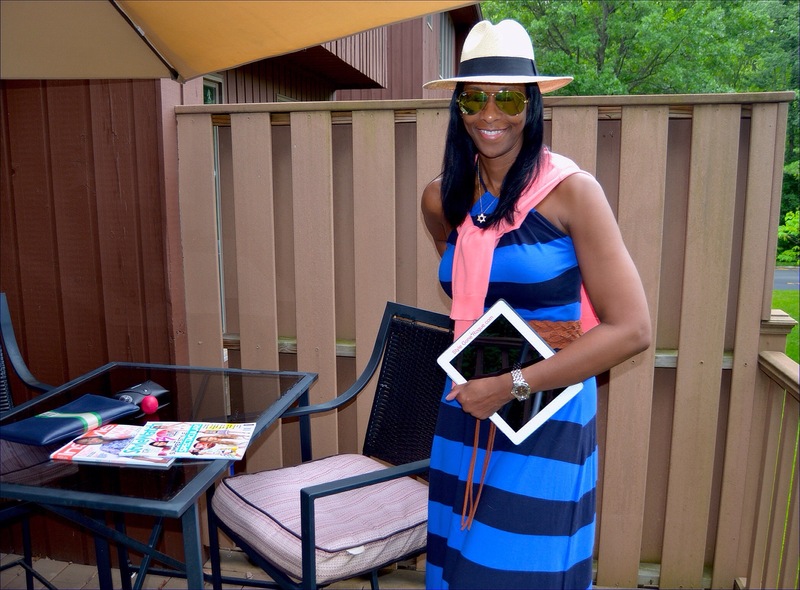 Fedora: J.Crew (old) | Sunglasses: Ray-Ban (old) | Dress:J.Crew (now on sale) | Belt: Here at Nasty Gal | Bracelets: Hermes, Kiel James Patrick & David Yurman (old) | Ring: David Yurman (old) l Sandals:Exclusively here at Saks Fifth Avenue -now on sale | Watch: Raymond Weil (old) Too short and too boxy….not when I’m done with it. 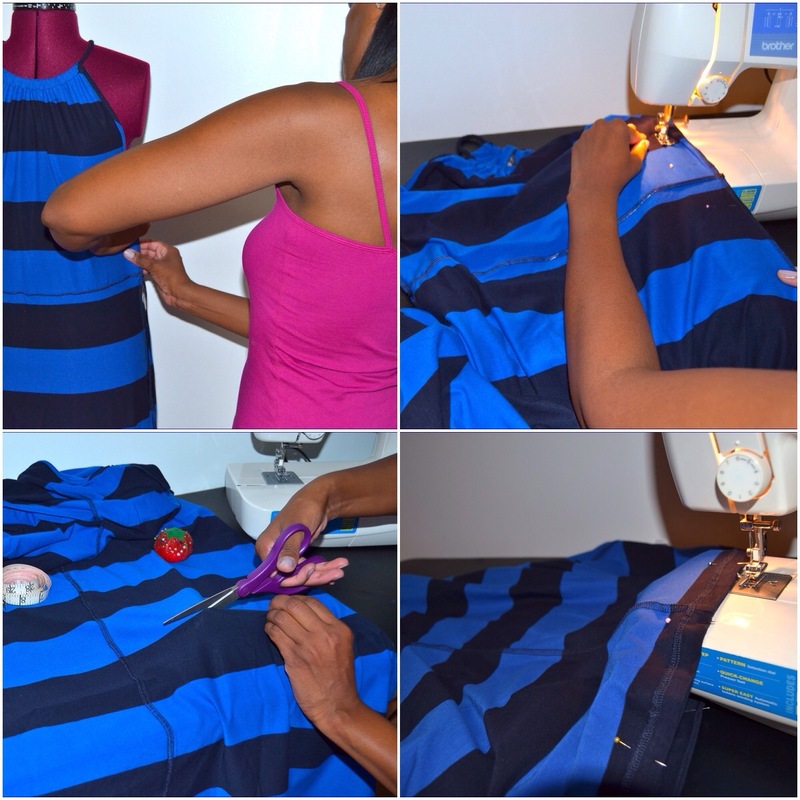 This dress not only needed more length but needed to be narrowed in the waistline. I really love what you did with this dress! 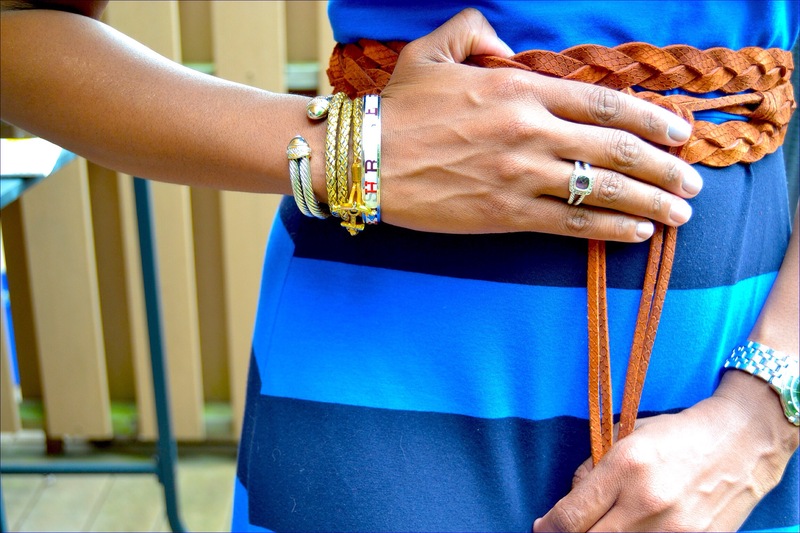 That belt is perfect with it and I love all your bracelets too! Thanks Megan. I’m in love with that belt. It’s the perfect neutral to go with so many pieces in my closet. Thanks Monica. Now I have two dresses. Long and short. I can never order a maxi online because I just never know how it will fit. I totally feel you. I’m 5’10” too. Love the belt on this! Thanks Amy. I also look to see if they give the length of the dress or the hip to floor length as that really helps. Not sure of your price point but Young, Fabulous & Broke make really long dresses. So long wherein I have to shorten them. 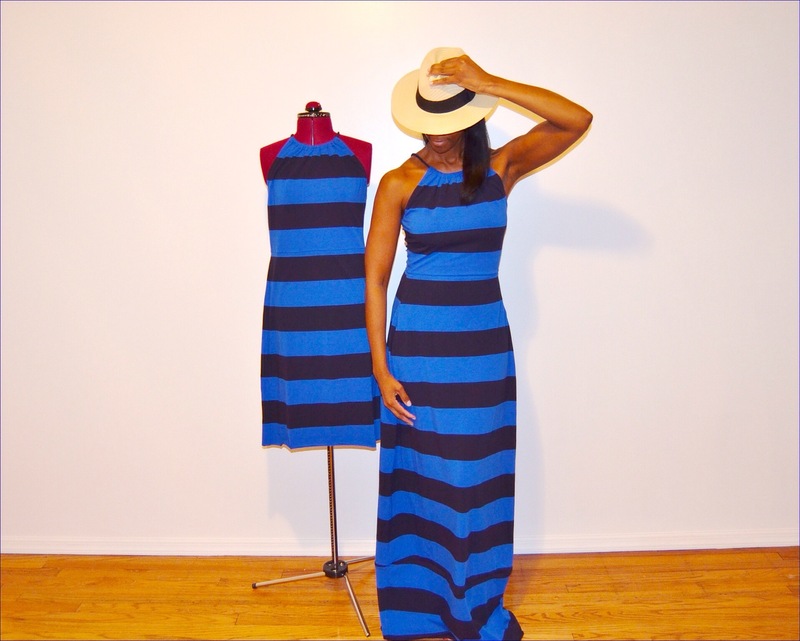 Also, an online store, Alloy carries tall/long maxi dresses & skirts. Tall girl problems, we can’t win. it turned out great, so perfect! I love this dress both ways! You did an awesome job. Great job! I love that belt. Thank you Diane. I have a feeling you’re going to get sick of seeing this belt. I’m obsessed with it! It turned out perfectly! I’m so impressed! 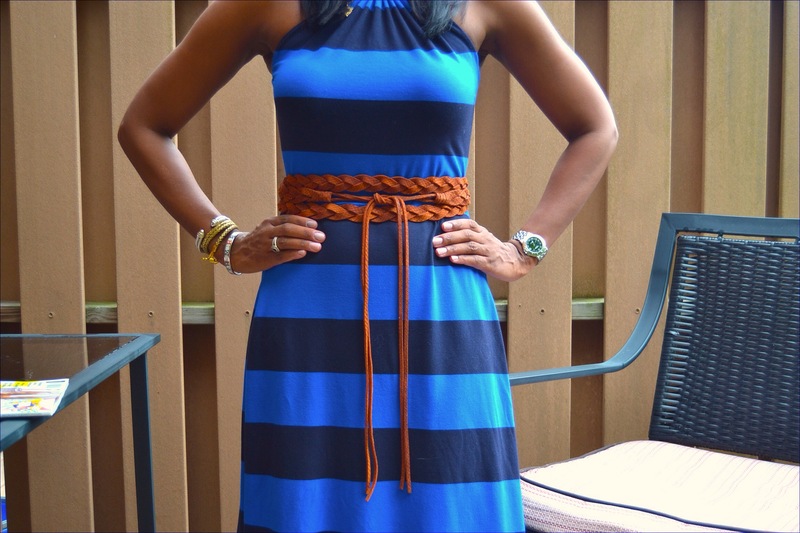 And I love how you wore it belted it looks amazing on you! Thanks Caitlin. Though I love rugby stripes, I felt the dress needed to be broken up a bit. Thanks Lauren. You’re right, I have two dress that are the same but oh so different. At first I was going to toss the one I cut but thought, why not have a short version. Great job! Love the belt! Thank you Adriana. The belt seems to be a real hit! That is such a great idea! I never would have thought about doing that! I usually find maxis to be too long! Too bad I couldn’t have just given you material!! At least now you have it in a short version as well! Looks gorgeous on you! Lol, Denise we need to go shopping together. If a piece is too long, you can give it to me and I’ll add it to the matching piece. Perfect solution. The ideal shopping buddy. You did such a great job! Very clever and love how you thought outside of the box! Thanks Rach. When it comes to fashion, I always allow my creative juices to flow. It’s a mindset. Our maybe I’m just nuts. This dress is STUNNING on you! I love the color and silhouette! Gorgeous! Thank you so much Carly. The make-over was a must do. Wow this dress is fabulous! You look great in it! You’re so sweet Karen. Thank you very much. Resourceful girl! I love it! The end result is awesome! So true. Thanks for stopping by Natalia. Great job!! It looks so awesome. Thanks. I appreciate at that. Jeanne, thank you so much. You’re very kind. This is such a clever idea, especially since you were able to do it yourself! I would have never thought of something like this. It’s great because now you have two completely different (and of course, cute!) dresses!! Thanks Lauren. One has to be creative when they have tall girl issues. Love the dress and he colors! The colors are pretty great right. Thanks for stopping by. Thank you Eni. You’re much too kind. I appreciate it. Thanks Ashley, I love a DIY moment and seem to have them often. I like the dress, the color looks gorgeous on you. You got out of situation creatively and the end result looks great! You can make a mini of the other dress, or a top 😉 Take care! I plan to wear the shorter version when I go sailing. Now I have multiple options. Thank you so much. I just purchased that belt last week and already I adore it. You’ll be seeing lots more of it. Hahaha, love the fact that you DIYed the hem! 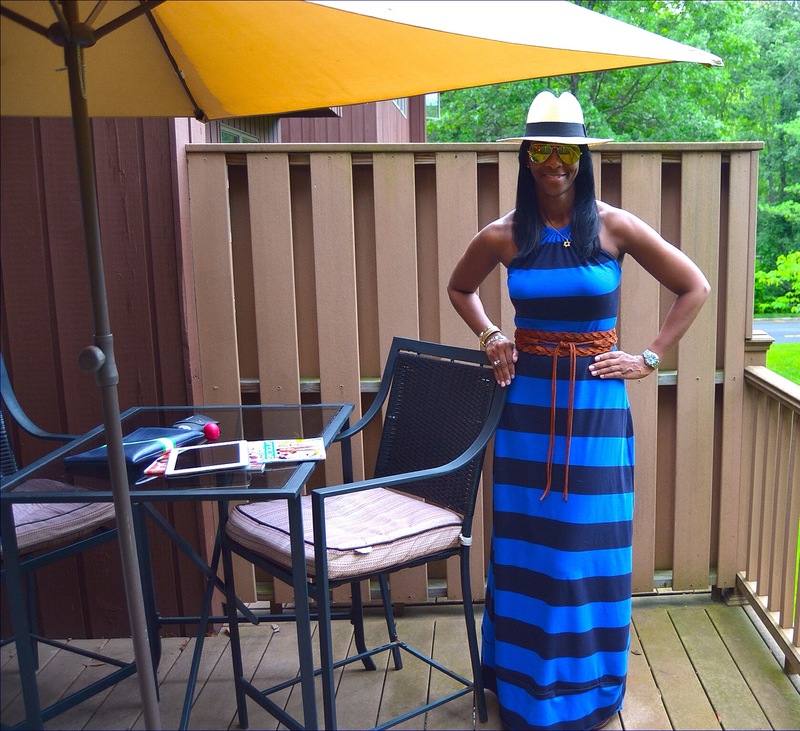 Also, how do you make horizontal stripes look so good?! The dress looks amazing on you! Hi May. Thank you. You’re much too kind. Not sure how I made the vertical stripes work. I think the belt helped to break it up and a different energy to the look. I really like how the dress turned out, it looks gorgeous! Woww!! I love your dress! You look gorgeous!! Thank you so much. You’re very sweet. Excellent look, the drees is perfect!! You’re adorable! ❤ ❤ Love your blog! Thank you so much Bethany. You’re so sweet. Thank you so much Carrie. Such a brilliant idea! You did a great job. Love it and thanks for the visit.